I’m working like gangbusters on laying track on Graveyard Curve. Graveyard Curve, on the prototype and on my model, is a 3-track mainline (uphill slow track, uphill fast track and a downhill track). 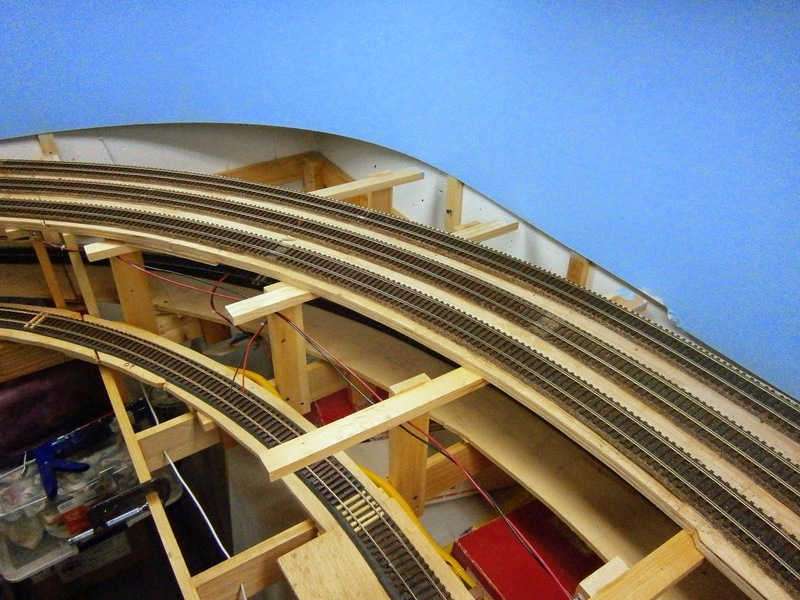 The center track of the three has a 64” radius which, if you calculate the circumference around half of a circle, requires almost 17 feet of track. Sum up all three tracks, and the approach tracks from the west and this part of the layout is gobbling up flextrack like there’s no tomorrow. I’m sure that this situation is familiar to PRR modelers who recreate the PRR’s many 4-track mainlines. In addition to material (track, roadbed, etc.) this construction is consuming another precious commodity – time. 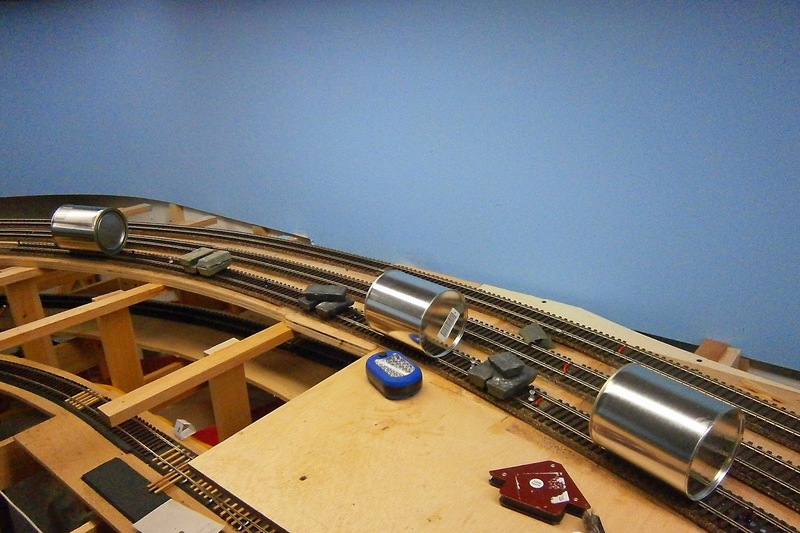 I’m racing to get at least one track of the mainline finished by my next open house, April 25, and time grows short. To have any hope of making it, I have had to modify the procedures that I have been using since I started building (and it’s about time, too). 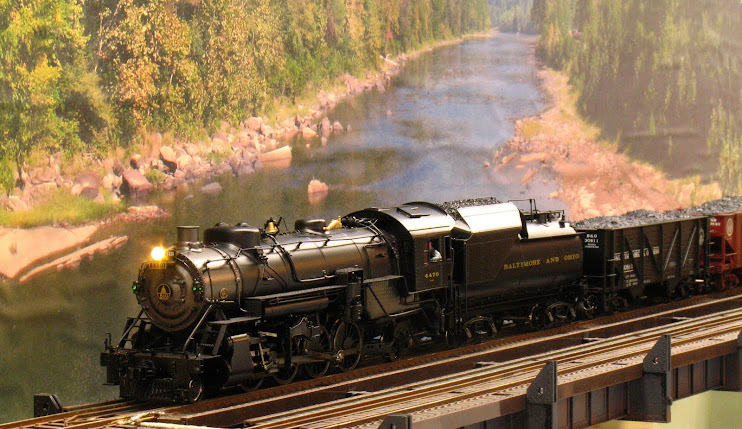 When I started this layout I, like many, had been reading Model Railroader for many years. One of the things that they drilled home was that if you wanted to run your railroad, then your track work had to be first rate or trains would be derailing every few minutes. I took this to heart. So in the beginning, I would lay half of a strip of roadbed on one side of the centerline; wait for that to dry, at least overnight and often longer; then lay the other half. All of this so that there was absolutely no chance of anything moving during drying. I was scrupulous to have everything EXACTLY on the centerlines as I had drawn them out. 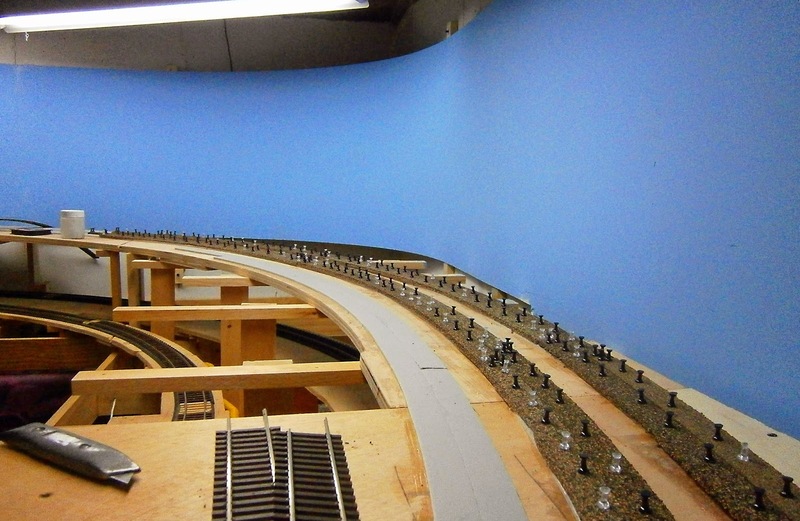 When I moved to two-layer roadbed, that was four half-strips that had to dry before track could be laid. Needless to say, progress was glacially slow. Also, I do not like to leave a job half-finished and return to it. Therefore I tried to dedicate all-day Saturday to working on the railroad to make sure that I had enough time to finish jobs. Surprisingly, I was able to dedicate many, if not most, Saturdays for a period of almost 3 years and regular progress was made. This has not been the case in the 3 years immediately past. Finally, my new job (which is, very likely, my best ever) involves a commute that leaves me only 2 hours after dinner each night of free time - so weeknights had been out. So with a self-imposed deadline approaching, something had to give. The first concession was that I was going to use any free hour - even if it was just to make a few wire connections - rather than wait for a solid block of time to open up. Next, I wasn't going to wait for each half of a roadbed strip to dry before laying it's twin. I've begun, with some trepidation, to lay great lengths of each layer of the roadbed. I still have to wait for the lower layer to dry - although not overnight - before laying the top layer. However, once both layers of my two-layer roadbed are down, I wait overnight for it to dry because the next step - sanding the cork layer - puts the stack-up under strain. Now admittedly, some of this is possible due to my developing experience and confidence in my track-laying system. So given all of the above, what does Graveyard Curve look like? Here's a photo of the roadbed going down. The first layer of topper (camper top) tape is going down on the track to the left. Cork roadbed is being held down in place by push pins on the two outer tracks. This view is at the start of the curve proper and looks uphill (eastbound). The topper tape has a very aggressive pressure-sensitive adhesive (PSA) on the back. However, I still lay it in a bed of adhesive caulk. The caulk allows me to slide the tape right up to the centerline, whereas the PSA would grab at first contact and pulling it off tears the tape. The tape will keep it's position until dry with only the caulk holding it down (I used to hold it down with push pins too - not anymore). The "cork" (actually there's little cork left in it, it's largely ground rubber) is also laid in adhesive caulk, then I hold it in place with pushpins until dry. Working this fast, I'm not able to make the nearly invisible seams like I used to; but that's the price that I had to pay. Next, the track goes down. In this photo, the track has been laid in adhesive caulk and is being held with pushpins and weights until the caulk is dry. The cans are empty quart paint cans that are filled with compressed wet sand, which is surprising heavy. The other hold-downs are bars of lead (don't try this at home!). The tracks below are associated with staging. Here's how it looks today, and will likely look for the open house. I'm only 2/3 of the way around the curve and I'll probably not complete the innermost track by the 25th; unless I finish everything else early. I can run bi-directionally on the two uphill tracks (the prototype did this too and was signaled for operation in both directions on all three tracks). Both tracks on the helix are just short of the summit. They are holding there while I finish building some turnouts which are just beyond the summit. There's still the question of the hanging section between the summit and the end of Graveyard Curve. I've bought a job-site (portable) table saw to help me make parts to suspend this section. Now if the good weather will stick around to let me use it.